The plight of veterans has been on my mind a lot lately. That’s uncharacteristic for me because I don’t have any close friends or family members that have served in the military. 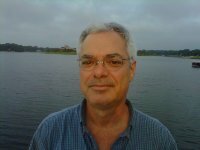 My father was drafted in the late 50s and trained at various camps after law school, but only told stories of military life as if they were part of an ongoing comedy series. He and my now godfather were frequently sneaking off base to be with their wives they stashed in nearby apartments, getting drunk and covering for each other. His gravest injury, if you believe the story, was at the hands of an exact-o knife in Providence, Rhode Island where he was training to censor soldier’s letters home around the time of the Cuban Missile Crisis. But sometime around Memorial Day every year, my emotions—and attention—begin to prick up as I survey the horrendous way this country has taken to treating our soldiers. A recent New Yorker story is a must read that is a mighty damning look at the sorry state of the V.A. hospitals and its (in)ability to treat our soldiers returning from Afghanistan and Iraq with post-traumatic stress disorder. Whatever my feelings about this “war on terrorism,” I am heartbroken that our country is breaking their promise to these young men and women who are serving in harms way. Our promise that in exchange for risking their lives we will honor and take care of them. All this to give you a frame of reference for where my head was at when I received a copy of a curiously titled biography Dreadful: The Short Life and Gay Times of John Horne Burns, by Vanity Fair contributing editor David Margolick. I don’t agree to do many book reviews for the site, mostly because I simply can’t commit the time I feel authors deserve for me to get through their books close to publication date. But there was something oddly different and intriguing about this book. If you read no further here’s my take: pick up this biography for an insightful examination of a lost literary hero who wrote a seminal book about life in World War II—including gay life. Yep, we’re talking WW2. Not quite the Tom Hanks scrubbed clean greatest generation kind of stuff. And although Burns is no sympathetic character, Margolick makes clear that he’s worth remembering as part of our gay literary history that’s slipping away. Happy Gay Pride Month. 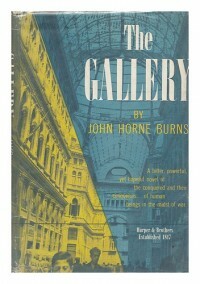 Burns is now a forgotten literary figure who wrote one of the most remarkable—and admired—post-World War II novels The Gallery, based upon his own service in themilitary. What’s most astounding is that the gay (and probably self-hating) Burns detailed gay life in the military in a way that Gore Vidal proclaimed it among the greatest gay writing of the 20th century, and that even Ernest Hemingway praised as “wonderfully written.” Critics routinely named it one of the best post-war books at the time—completely ignoring the overt homosexual themes and characters in the book. When James Michener won the Pulitzer Prize for South Pacific, it was considered an enormous upset over Burns. Surprised you’ve never heard of him? That’s exactly Margolick’s masterful point in resurrecting through meticulous yet utterly readable facts and research the sad story of a not particularly sympathetic author with such promise, who sunk into oblivion and died at an early age. In a way, Margolick’s search and resurrection of the legend of Burns reminds me of Frank Rich’s recent New York Magazine essay about reminding modern readers that an entire generation of important gay men and women’s stories are on the precipice of being lost to us because they were closeted and often ignored. But unlike Rich’s theater mentor, Margolick’s subject is far from sympathetic. Burns was nasty, judgmental, and a self-described snob making him extremely difficult for anyone to like. Which makes it so fascinating that Margolick—a straight man, thank you very much—goes after Burns’ story with such passion, but admirably remains objective and able to point out his many flaws and foibles. Margolick’s connection to the subject is a shared past with the prep school Loomis. 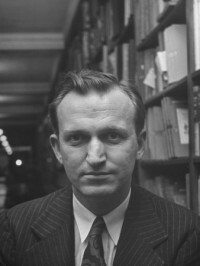 Margolick as a student, and Burns, years earlier as an English teacher pre- and post-war who ultimately wrote a mean spirited and thinly veiled satire of the school in his second book Lucifer with a Book. The tome was so hated by the school community—and pretty much reviled by critics—that the school banned it from its library. Which of course made the boys only more desperate to get their hands on it to revel in the seedy descriptions of the teachers and teenage boy gay sexual activities. Cleverly, Margolick opens the book with this story to give it the personal connection it needs. It’s as if Margolick has researched and written an entire book about a minor character in any number of John Irving’s novel set at an Eastern boarding school. 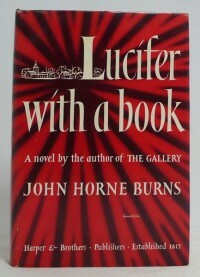 I was hooked from the get-go despite the completely unlikable nature of Burns from start to finish. It’s truly like watching—and reading—a train wreck unable to take your eyes off the collapse of such a talented soul. Margolick deserves immense credit for soldiering through such an incredibly hard book to write. First, the subject himself is little known so Margolick has to work overtime at the beginning to explain Burns’ historical significance. He’s helped by drawing upon big names like Vidal, Hemingway, as well as practically every review of the time fawning over Burns. But I couldn’t help wishing for a few more excerpts from The Gallery to demonstrate Vidal’s love of its prose. Second, Burns is so thoroughly despicable that keeping the reader engaged in what might happen next is a mountain to climb. But Margolick scales it time and again structuring a real page turner. To his credit, Margolick never delves into much analysis of Burns’ behavior, rarely ascribing his acidic attitude to self-hatred, leaving it to others who knew him to make those projections. Time and again, I was amazed at the amount of source material that Margolick was able to unearth about Burns. From letters of prominent American expats in Florence and Naples who came into contact with Burns on their travels, to interviews with former students, he leaves no stone unturned—and fashions them into a compelling narrative. It’s not until the end of the book that you realize what a tremendously difficult time he must have had because Burns very Catholic family for a long time refused many requests by researchers access to their private trove of papers. Why? They didn’t want Burns to wind up in the dustbin of gay writers. Now, they should be so lucky. Although, with a title like Dreadful, a reference to coded language that Burns used to mean homosexual in his letters to close confidant, it’s hard to see gay boys picking this book up as light summer reading on Fire Island. Although they should. Ultimately, Burns as a gay man serving in the war was able to leave behind a story that depicts a side of the military we rarely see. He was a veteran who didn’t really get a fare shake. It’s dreadful that things haven’t changed, really. 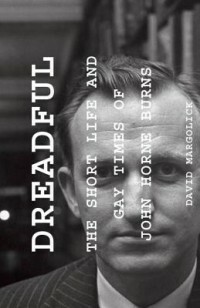 But there’s nothing dreadful about Margolick’s terrifically crafted biography that places Burns back into the public consciousness as a breakthrough gay writer who deserves our respect—and recognition. Coming Up: Jon Paul follows the Crumm and falls under the spell of a hipster puppet boy. Coming Up: JP's adoration of 70s and 80s hit TV shows lures him to a mountain retreat. Coming Up: JP falls in love all over again with Gully Wells and The House in France. Coming Up: JP shakes up his summer wine doldrums with a Spaniard.